PETALING JAYA: The Automated Enforcement System (AES) will begin operations at midnight on Saturday in 14 “blackspots” to catch drivers who break speed limits and jump traffic lights. For the first phase of the AES, 14 cameras were installed at Perak, Selangor, Putrajaya and Kuala Lumpur, with 10 of the cameras to catch speed limit breakers and four to catch those who jump traffic lights. More cameras will be installed at 817 blackspots in the second phase, which will see a nationwide implementation of the AES. Road Transport Department (JPJ) director-general Datuk Solah Mat Hassan said the implementation of the AES was a serious move by the Government to reduce the number of road fatalities. “Hence, the AES cameras are installed at “blackspots”, or locations identified as accident-prone areas with high incidence of deaths,” said Solah in a press statement on Saturday. Solah said the public could check out the locations of the AES cameras on JPJ’s website at www.jpj.gov.my, adding that road users would be able to know they were in AES operation zones through signboards. “By knowing where the AES cameras are located at, road users will be more careful and will drive according to the law. It will reduce the number of deaths and our objectives to ensure the safety of road users will also be met. The public should see the implementation of the AES as a way to educate the road users, not as a means to give JPJ extra power to issue summons,” said Solah. He said AES camera warning signs for no-speeding areas would be visible two to three kilometres before the cameras. For cameras that record offences of people who jump traffic lights, the warning signs are located 50 to 500m of the traffic lights. Solah said images captured by the AES cameras would be sent automatically to the AES control centre and the vehicle registration numbers of the alleged offenders would be cross checked with JPJ’s database, before a summons notice was sent to the registered vehicle owner. “The process of cross checking, identifying the offence and issuance of summon notices is done by trained JPJ officers who are based at the AES control centre. “If the captured images do not match with the vehicle registration details on JPJ’s database, further investigations will be carried out. ” This is to ensure that only valid summons according to road laws are issued, as well as to avoid from summons to be issued to innocent parties,” he added. Summon notices that have been processed and verified will be sent to the registered vehicle owner within five days of the offence date. The notice will contain information of the vehicle, time of offence and the capture images of the vehicle. “However, if the registered owner is not the driver of the vehicle at the time of offence, they can submit the drivers details to JPJ after 30 days from receiving the summons notice. If they choose to be present in court, they can do so at the time and date that is specified on the notice,” said Solah. Solah said those who receive AES summons notice can call the AES Control Centre for further questions at 03-7846 4400 for offences committed in Perak and 03-7628 8268 for offences in Selangor, Putrajaya and Kuala Lumpur. KUALA LUMPUR: INVESTIGATORS probing into the financial background of several non-governmental organisations have uncovered attempts by foreign hands to destabilise the government. MkiNi Dotcom Sdn Bhd (RM298,000); and, otheRS (RM13.3 million). The monies were also allegedly channelled to the Southeast Asia Centre for e-Media (Seacem), Southeast Asian Press Alliance and the Centre for Independent Journalism. From last year, several other set-ups, namely Bersih, Merdeka Center for Opinion Research, Lawyers for Liberty, Liberal Banter Sdn Bhd as well as the International Republican Institute, began receiving funds from NED, an organisation that had been claimed to have “played a significant role in attempting to destabilise legitimate governments and replace them with client proxies”. Bersih co-chairman Datuk S. Ambiga was reported recently to have admitted that Bersih had received funds from the NDI as well as New York-based Open Society Institute, the administrator for programmes under the Open Society Institute founded by maverick currency speculator George Soros. NED, on its website, said “it is a private, non-profit foundation dedicated to the growth and strengthening of democratic institutions around the world”. It also claims to be a unique institution where it could provide “flexibility that makes it possible to work in some of the most difficult circumstances, and to respond quickly when there is an opportunity for political change”. It is believed that organisations with “programmes consistent with its objectives” are awarded grants. Sources also revealed that Suaram, which is under several investigations, including for allegedly raising funds while operating as an unregistered society as well as for serious violations of at least five sections of the Companies Act, along with Suaram and Suara Inisiatif Sdn Bhd the company that is linked to it, had four known foreign funders. Aside from NED’s estimated RM1.6 million already in its coffers, Suaram is also believed to have received RM774,000 (between 2008 and last year) from New York-based Open Society Institute, the administrator for programmes under the Open Society Institute. 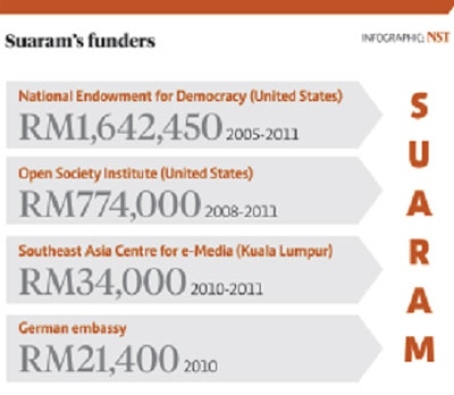 The German embassy, meanwhile in 2010, allegedly gave Suaram RM21,400. 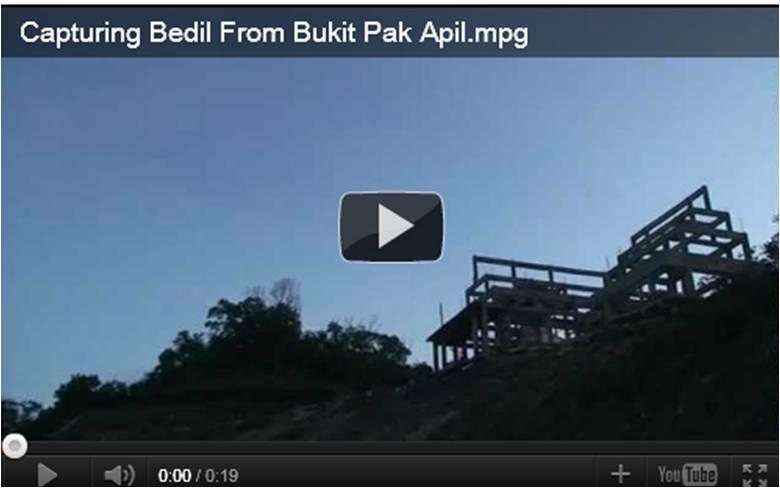 It was reported that the embassy had admitted that it funded Suaram’s project that particular year. Another RM34,000 was also allegedly channelled to Suaram by Seacem. The links of these establishments are apparent, with Seacem on its website acknowledging that it was supported by OSI. Seacam, meanwhile, under its fellowship programme, offers its fellows placement in Malaysiakini. Suaram’s accounts and “money trail” are also allegedly being looked into by Bank Negara Malaysia. Recently, Domestic Trade, Cooperative and Consumerism Minister Datuk Seri Ismail Sabri Yaakob called on Bank Negara to probe Suaram under the Anti-Money Laundering and Anti-Terrorism Financing Act 2001. He had also asked the Home Ministry and Registrar of Societies to determine Suaram’s status. Many quarters have questioned the need to have outside influence interfering in the country’s political agenda. 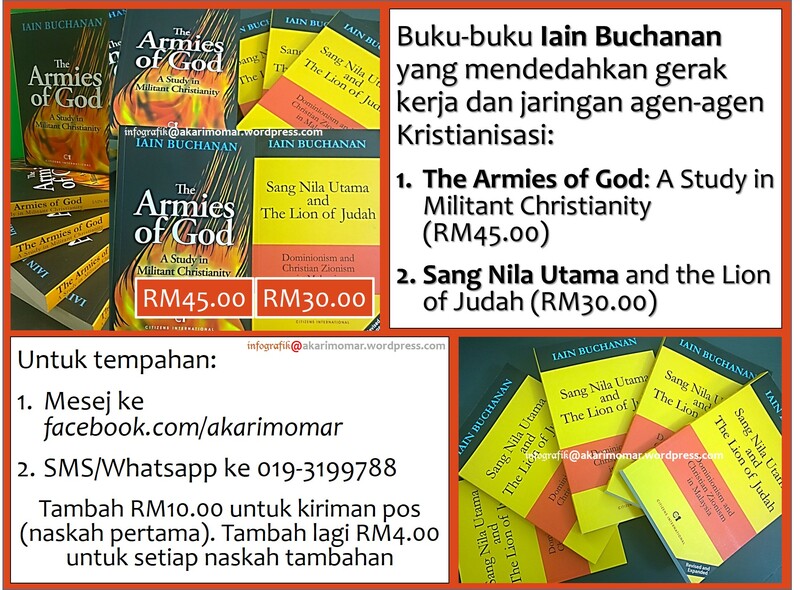 They have also called on several key opposition figures including Parti Keadilan Rakyat’s Tian Chua, Suaram director Kua Kia Soong and co-founder R. Sivarasa to explain why Suaram was being funded by foreign parties, including by Soros, when he had allegedly masterminded plans to bring the country’s economy down. They had also been asked to clarify whether they had received foreign funding to support their political activities. Former PKR leader Ng Lum Yong had demanded that the trio publicly explain Suaram’s funding as the people wanted to understand its true role as an organisation. “The people have the right to know about Suaram’s true political agenda and its motives,” Ng said. In an interview with BH last night, International Movement for a Just World (JUST) president Professor Dr Chandra Muzaffar said NED had been known to lend substantial financial support to NGOs in particular countries like Egypt, Tunisia, Libya and Syria. He claimed it had been uncovered that such efforts had been going on aggressively over the past five years in the name of democratic freedom with the objective of making people rise up against leaders who were allegedly deemed to be cruel. He also claimed they handed out assistance with the objective of stirring up the people, and their contribution was akin to udang disebalik batu. “We know of their activities in several countries as what has happened in the Arab world, leading to the Arab Spring uprising. “There is also proof they provided assistance to groups opposing leaders in South and Central America at one time with the excuse that the leaders were tyrants and undemocratic. Chandra, who is also the chairman of 1Malaysia Foundation, said the credibility of such an organisation which claims to support institutions of freedom and democracy was questionable as it could threaten global security. He added that those behind the body included Zionist groups which maintain good relations with the Jewish government.